Campbell Soup, best known for its eponymous line of canned soups, has stumbled in recent years. 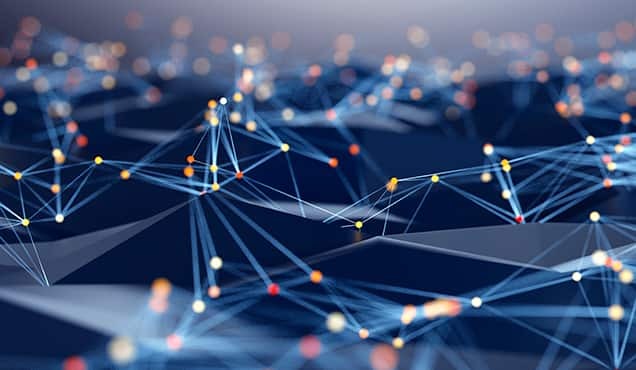 The firm's struggles culminated in the unexpected departure of CEO Denise Morrison in late May, following the report of weaker than expected Q3 earnings and lowered FY 2018 guidance on May 18th. Unsurprisingly, equity holders were not thrilled with these developments and the share price has declined 12% on the earnings report, reaching a YTD low the first week of June, down 30% from the start of the year. Since then, a remarkable rally has lifted shares back above the price level which preceded the Q3 earnings report. 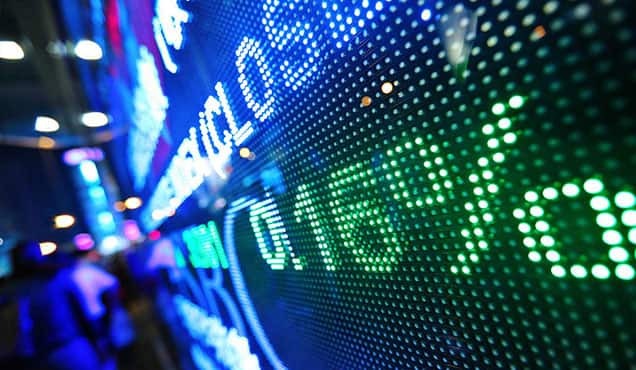 The reversal in the declining share price was partly due to activist investor Dan Loeb's Third Point purchasing a 16m share stake in the firm, which was initially reported in early July and confirmed on August 7th when the hedge fund filed a 13-D. 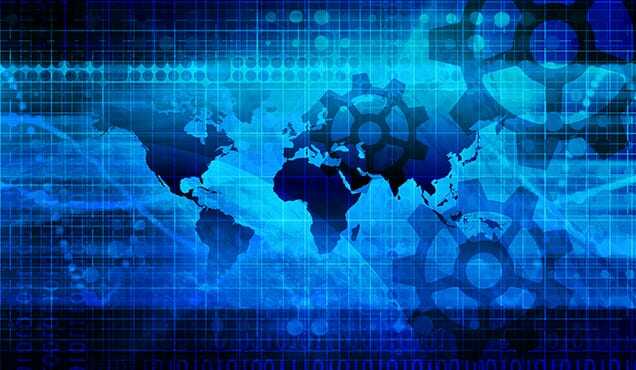 In that filing the investor expressed the opinion that, "the only justifiable outcome of the strategic review is for the Issuer to be sold to a strategic buyer." The firm's struggles have drawn the attention of short sellers. Equity shorts began building a position in CPB in June 2017, following a 16% downtrend in price from the post-crisis peak in July 2016. Over the last 12 months, the short position has increased from 8m shares to 31m shares at present. It's worth noting that there has been short covering at the margin, with a decline of over 5m shares since the YTD peak in shares short, observed the 2nd week of June. 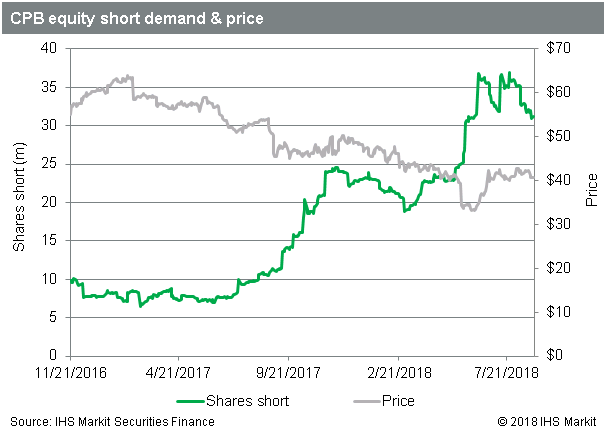 In dollar terms the short position peaked at $1.5bn on July 12th and currently stands at $1.3bn, with the recent reduction of shares short offset by shares rallying over 20% from the YTD low on June 6th. Credit shorts have also taken an increased position in the firm's debt, building a short position from less than $20m at the start of 2018 to a YTD peak of $380m at present. Nearly a third of that increase, $117m, coincided with the issuance of $5bn in debt which the firm took on to acquire pretzel maker Snyder's-Lance in March. Credit shorts have been most active in the 4.15% 2028 note, which has $156m short, the highest demand post-issuance, on an increase of $44m in the last month. There has also been an uptick in demand for the 3.65% 2023 note, which also reached the highest level of demand post-issuance in the last week. 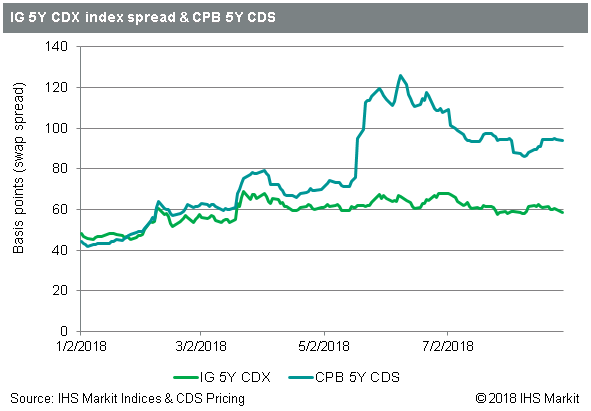 The CPB 5Y credit default swap (CDS) spreads widened from 48bps at the start of 2018 to a peak of 125bps on June 8th. The cost of credit protection had a larger initial reaction to the firm's Q3 earnings report and CEO departure than it did when Moody's downgraded the firm's unsecured debt rating in March (over concerns related to the debt-funded Snyder's-Lance acquisition). For context the IG 5Y CDX index has traded in a range between 45 and 70bps this year; The current level for Campbell at 93.79 is at the higher end for IG credits. 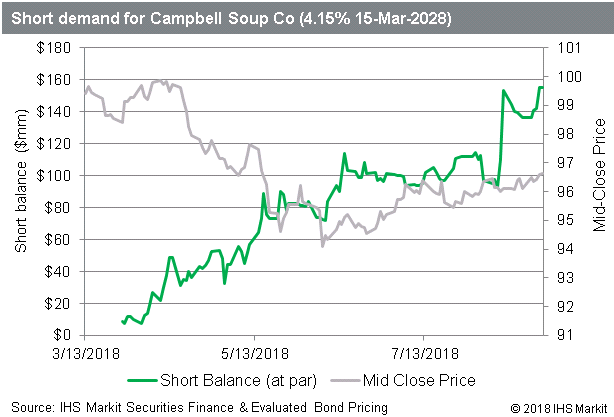 The net notional outstanding Campbell Soup CDS has been between the range of $300m to $400m YTD, so part of the increase in short positioning in the underlying notes may be related to CDS market makers increasing hedges on previously written swap contracts. Bearish bets have increased this year, currently $1.3bn in the equity and $380m in the credit. 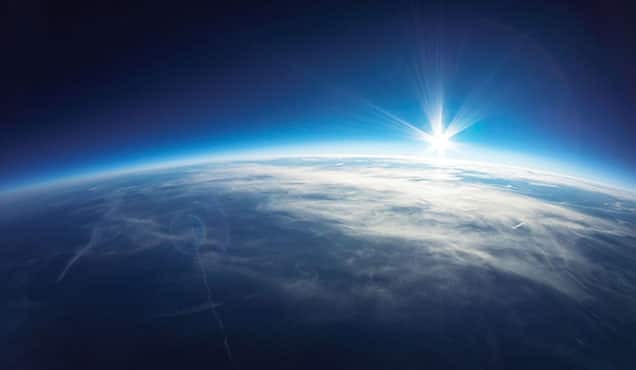 A bullish sentiment regarding strategic possibilities for equity owners has been expressed by an activist with a substantially positive track record. 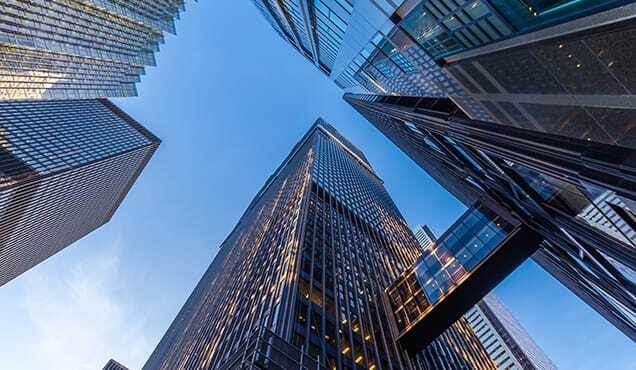 Moody's has placed the ratings for the firm's over $10bn of debt under review after the Q3 earnings in May, with the current rating Baa2 one rung above the minimum investment grade rating. Management of the firm has expressed a desire to reduce the current debt load through divestiture of business units; The activist long would prefer to see a sale of the enterprise. The descendants of John T. Dorrance, former full owner of the firm, still have a significant influence via share ownership and board membership. 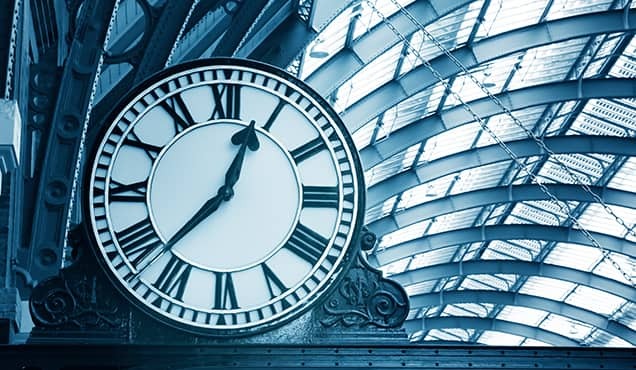 While there is significant anticipation for the results of the strategic review, the Q4 earnings report may also have a significant impact on the short-term performance of the firm's equity and debt. On the margin equity shorts have covered into this event, while credit shorts have advanced.